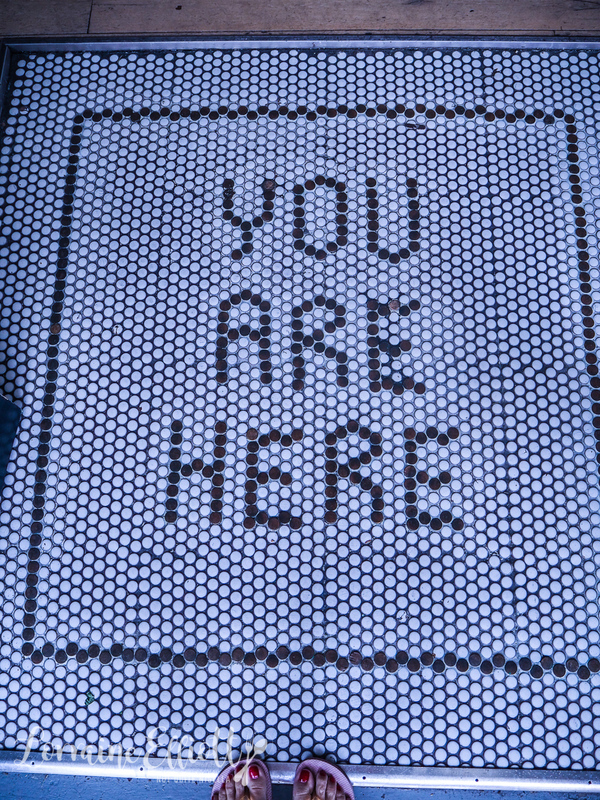 There we were. Sunday morning. We'd both finished our workouts and were ravenous. But we needed somewhere dog friendly as well as delicious. 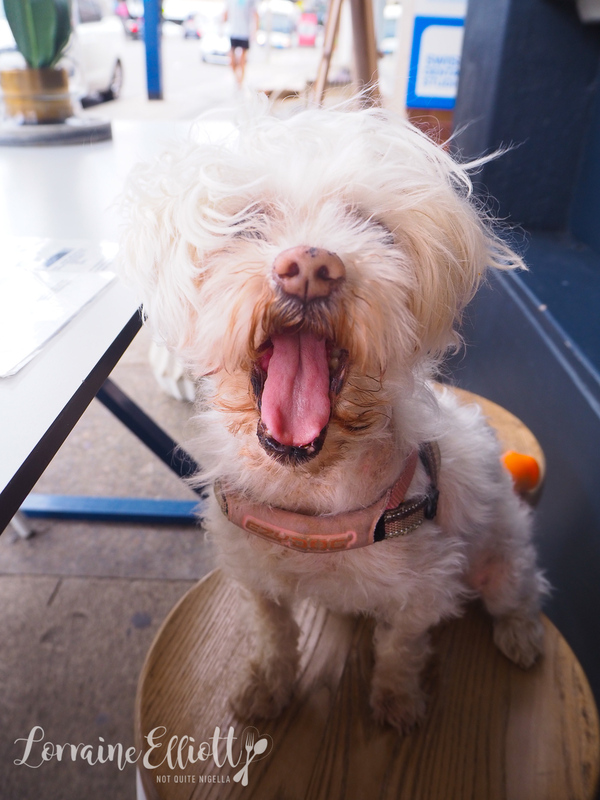 There are some suburbs where you are more likely to find a dog friendly eatery than others. Bondi is one of those. 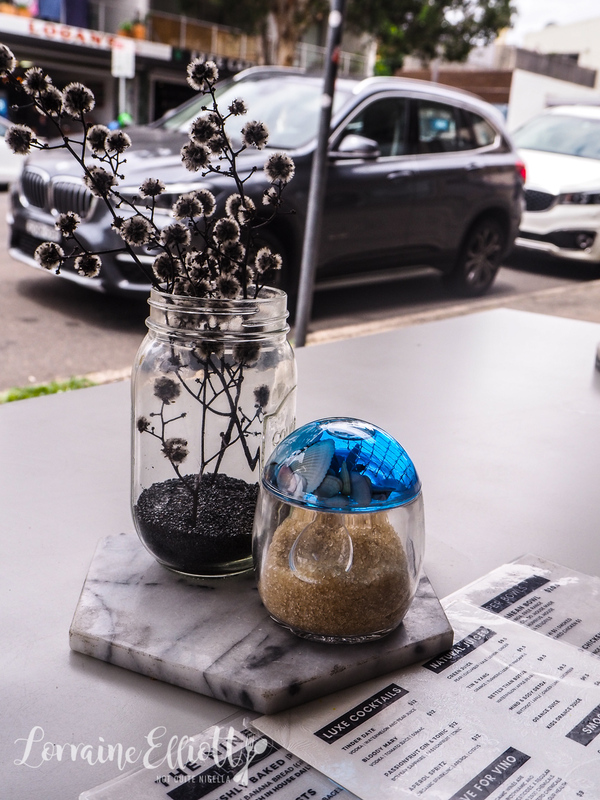 It usually corresponds with the number of outdoor eateries and the weather but walk down the main stretches of Hall Street and Glenayr Avenue and you can take your pick of pooch friendly places. 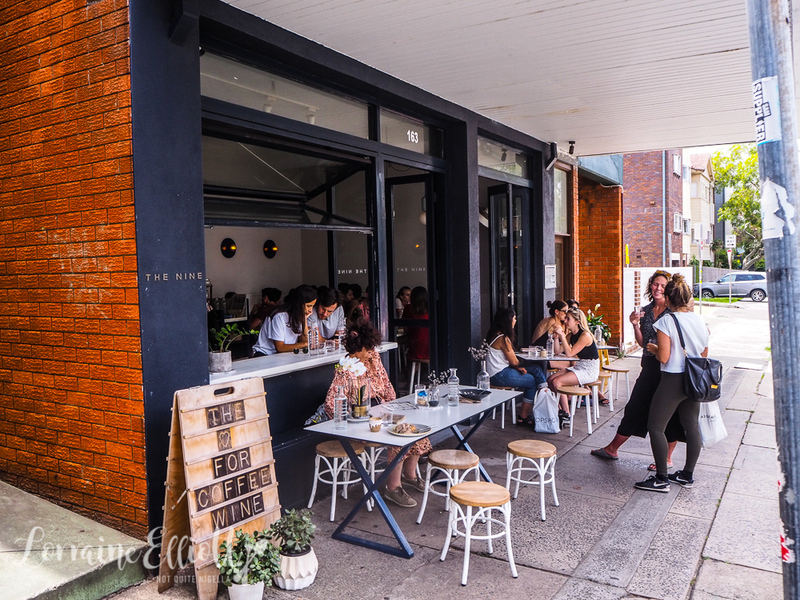 The Nine has been opened for a while now and serves a menu made up of healthy and regular food. They're also a cafe that takes bookings if you don't like to wait. The Nine from the name is said to represent 9 core Mediterranean cuisines and there is a focus on organic food and drink. I am eyeing off the breakfast cocktails with names like "Tinder Date" which at $12 is a great price and makes choosing difficult. But instead I go for the unicorn latte and Mr NQN has a chai latte. 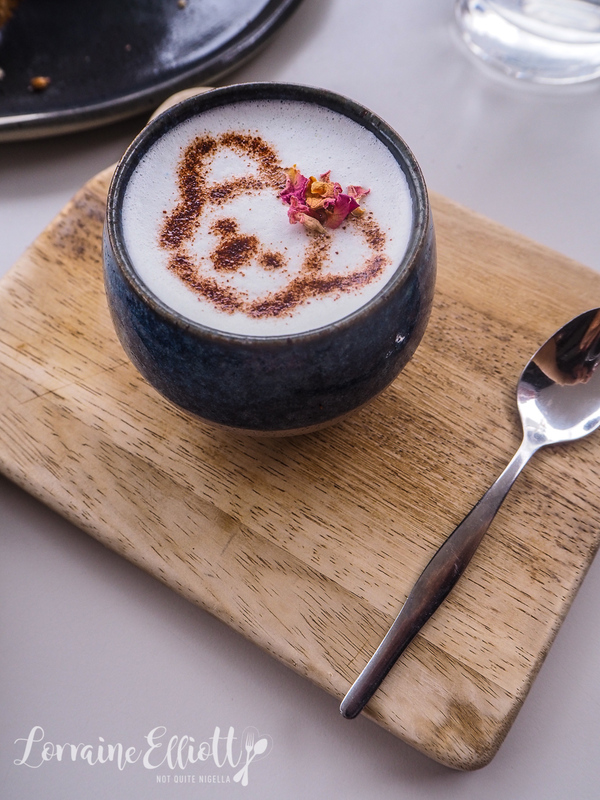 The unicorn latte is very cute with a bear pattern on top and tasting mostly of milk with some blue spirulina matcha. 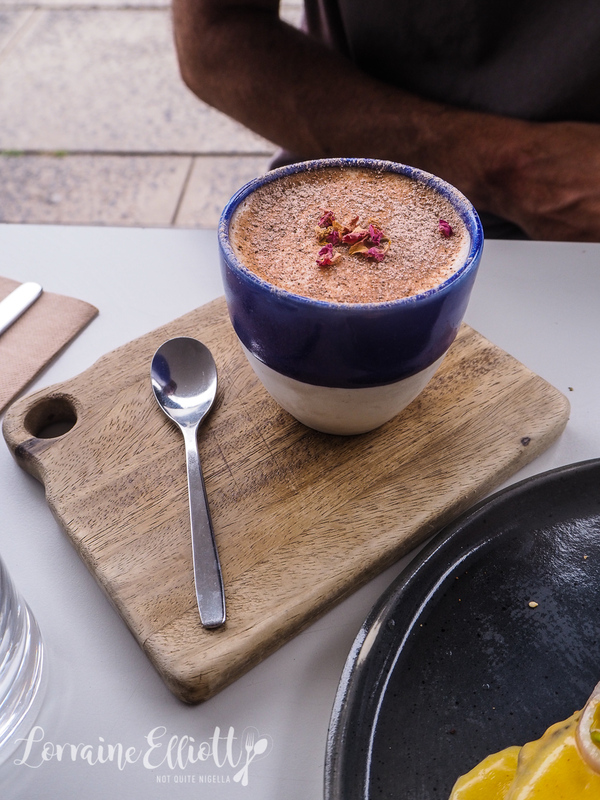 The chai latte has rose petals on top and is not made from a powder but from a real leaf and spice mix. I tend to go for savoury while Mr NQN prefers sweet. My choice is the Nine benedict. Their version is served on a seeded bagel instead of an English muffin. There's a choice of salmon, ham or bacon and I choose the smoked salmon. There are two soft yolked poached eggs and hollandaise sauce on top. 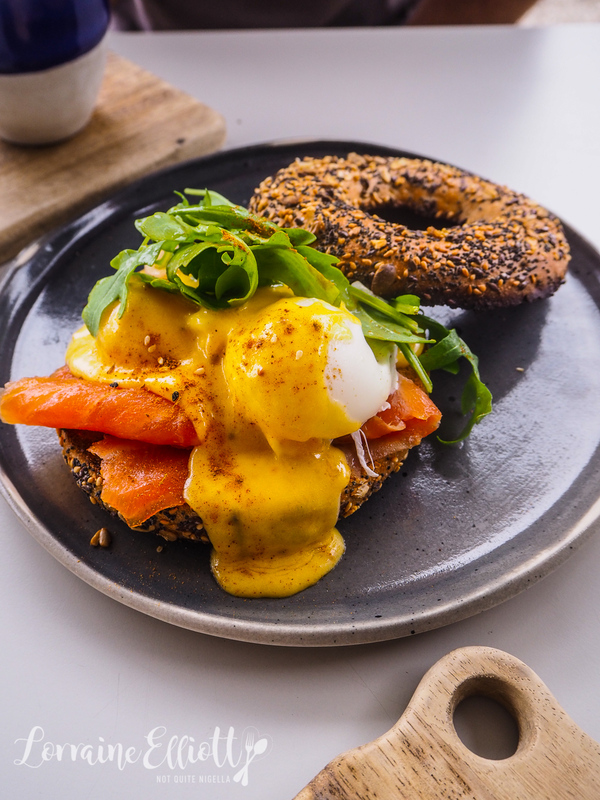 The bagel is really fresh so it doesn't feel too bready with the topping and there's a good amount of hollandaise and runny yolk to keep this moist enough. 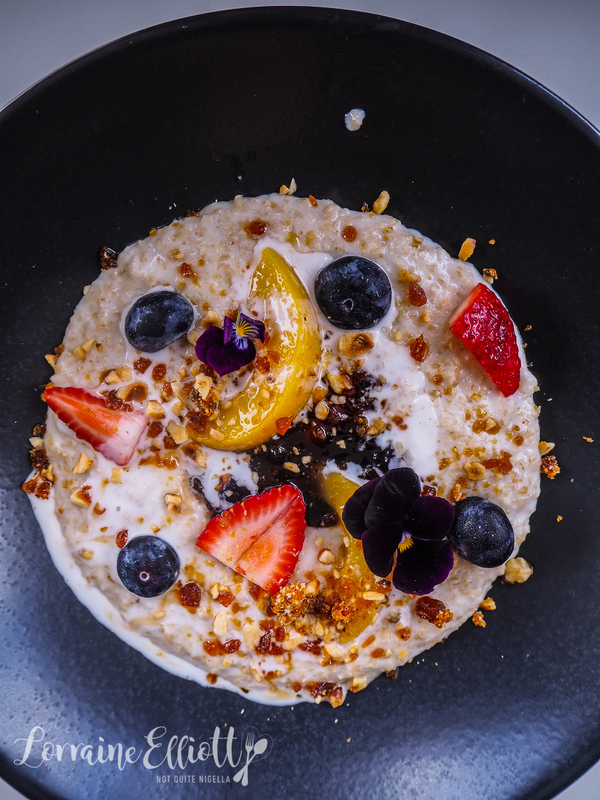 Mr NQN loves the wellness porridge with prune and blueberry compote, coconut cream, spiced yellow peach slices, blueberries, strawberries and hazelnut praline on a creamy warm oatmeal. I like the level of sweetness and how you can adjust it by adding more of the praline or compote. However I think both our favourite dish is the halloumi croquettes. We've had this before at other cafes and it's based on a Brazilian recipe (if you want to make your own I have a recipe here). 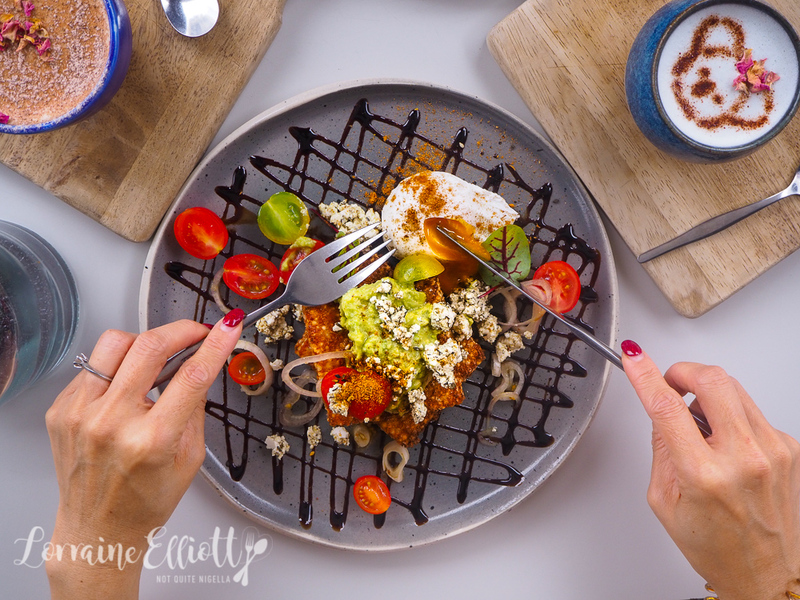 There are two slices of halloumi croquette with heirloom tomatoes, shallots, a free range poached egg, smashed avocado, za'atar, feta and a balsamic glaze drizzle. These croquettes could make a vegetarian out of a hardened meat eater. And even Mochi gets a little bite! So tell me Dear Reader, do you ever share three dishes between two people for brunch? And given the choice, would you choose salmon, ham or bacon?